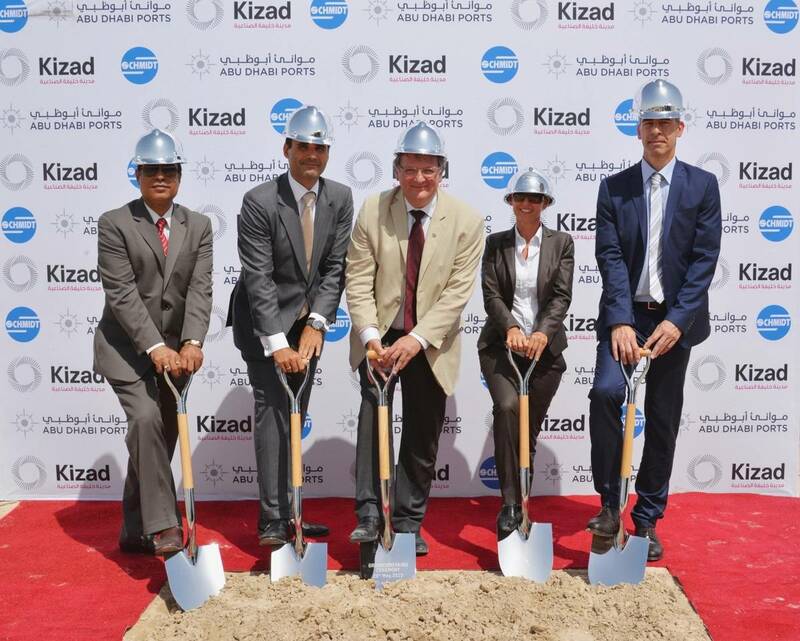 Abu Dhabi Ports celebrated the groundbreaking of Schmidt ME Logistics’ new facility in Khalifa Port’s industrial, trade and logistics zone, Kizad. The ceremony officiated by Dr. Wolfgang Hoppmann, CEO of Schmidt ME Logistics along with senior representatives from both companies took place on May 27, 2015. Schmidt ME Logistics specializes in the packaging, product handling and intermodal transportation of dry bulk products in addition to providing services to include patent technologies exclusive to Schmidt Logistics. Schmidt ME Logistics will cater to the dry petrochemical and mineral industries across the region and internationally. The company provided services catering to the growth in chemical manufacturing throughout the Middle East, Asia and other emerging regions. Such growth has created a need for asset-based logistics investment, coupled with local expertise and a global supply chain network capability. The new dry bulk logistics center which is the company’s second branch in the UAE, will cover 21,000 square meters and represents a capital investment of AED 20 million. The construction will be conducted in two phases. The first phase will include 2,000 square meters of warehousing which will be used to store dry material and to provide a range of product handling services. The second phase will include the construction of additional silos, truck parking facilities and full road transport services. The finished site will include quality management services, cleaning services, a repair shop and a service station. Schmidt ME Logistics will provide transport services for dry bulk products, will pack dry bulk goods into maritime containers, and will manage overseas long haul and short sea transport to end user locations. The company will also offer warehousing, silo bunker storage, container storage and palletized warehousing, bagging and de-bagging services. Mohamed Juma Al Shamisi, CEO Abu Dhabi Ports commented, “Today, Schmidt ME Logistics is one step closer to securing the business advantages that benefit investors locating in Khalifa Port’s trade and logistics zone. At the moment, the company’s primary export destinations are Saudi Arabia and Oman and customers include W.R. Grace & Co, Borouge, chemical company BASF, and Grand Mills Abu Dhabi.